When I was a child I had a lot of friends in our neighborhood, but especially one who I could feel confident and talk with about all kinds of things at home, at school, and anywhere. Since then, long time ago, she has listened to what I tell her, shares with me what’s happening in her life, sends cards, letters, gifts, announcements of accomplishments, and statements of wishes and hopes; more than I do. We used to sit outside her house by night and talk for a long while, until my mom told me to go to bed at 10 P.M. 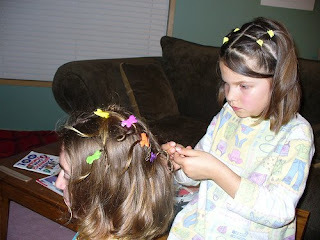 Most of thees nights I braided her long hair to comfort her dream sleeping time. When she finished her elementary school, I thought our friendship would finish soon. It didn’t happen. In our family, we had the opportunity to purchase a new house and we changed our address. It was a difficult time for me, my life was on fire: it was my adolescence. Then my special friend and I started to communicate by letter and cards. After that we tried to meet together at hers or my home. She used to work as a secretary and study English in the beginning. After, high school and Psychology at the University; I really don’t know how she did it, she always worked full time. When she attempted to get a job as a professional individual, she couldn’t find it. This was during the U.S. Economical depression affecting Mexico. Then she thought of coming to the U.S.A. and to get a better life, and she did it. I admire her because of her exceedingly good attitude. She didn’t have her father since she was a little child. Her mother worked as a seamstress to make ends meet, and she was the baby in her family. Our communication followed mostly by writing. She got married, and time seemed longer than before. I felt very worthwhile when she understood the my situation, being a student without working, because my parents didn’t permit it. She sent me a card with a money order. When she got back to Mexico, we always met and talked for hours and hours, drinking, and eating something. Now I live in San Francisco, she lives in Colorado with her husband and two children. They came to visit us already. I don’t know their house but I hope to visit them some day. Our communication by phone or by writing is still there. Now, she has an Education Degree and is working as Elementary School Teacher. She has worked at the Church community where she teaches religion and plays the guitar. She hasn’t forgotten our friendship. I always remember her and along the distance. We walk the life together. I still have a lot to learn from her and that is what I have been trying to do.